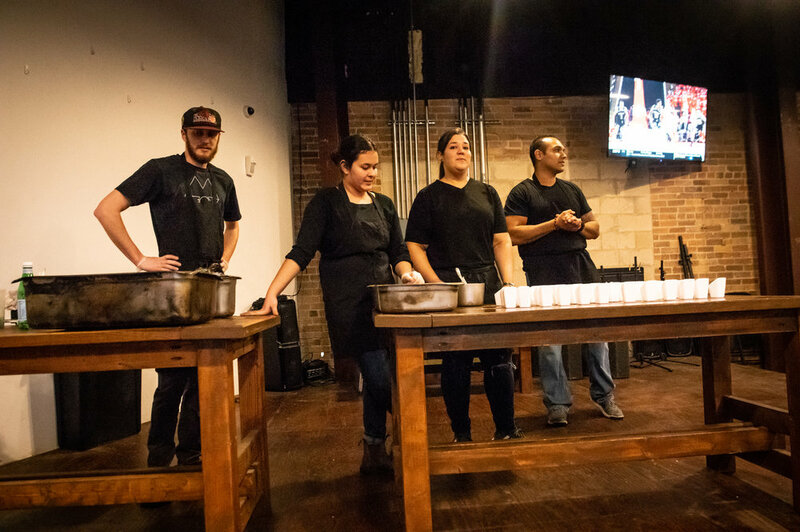 We’ve returned, once again, to one of Denton’s greatest gastronomic offerings: a beer pairing dinner, this time between Armadillo Ale Works and their delightful fermentables; Boca 31 and their artisanal Latin-inspired cuisine; and Ten:One Artisanal Cheese throwing in a smattering of cheeses, as if you weren’t already sold. 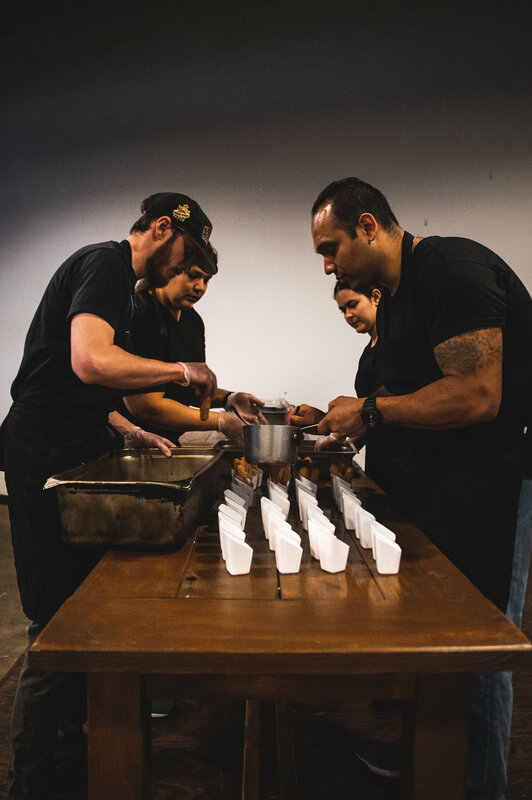 The five-course event was nothing short of inspiring. Between the wondrous magic of the pairings themselves, the playful introductions by our chef, or the poetic precision of the kitchen staff, it would be hard to walk away uninspired or under-stimulated. Behold, then, our takeaway, and join us in looking forward to the next such collaboration. In the meantime, though they may not come assembled as they do here, the constituent parts are available at any time. 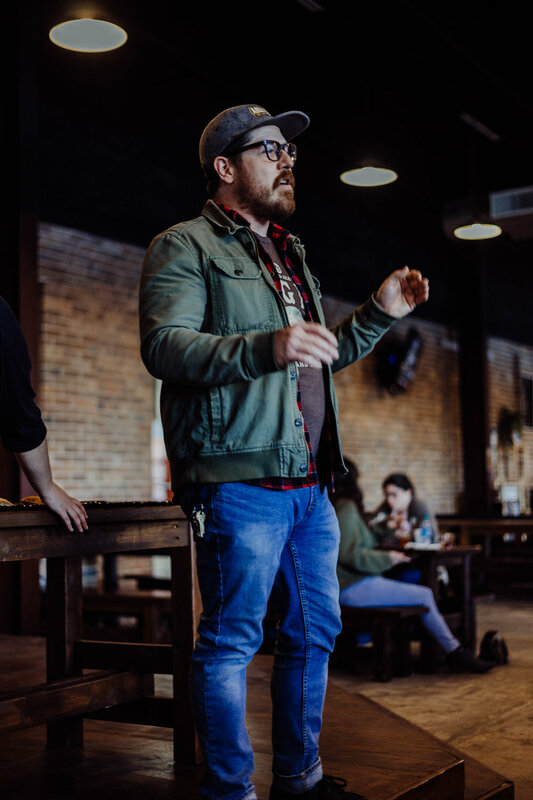 With a sip of the juicy Experimental IPA comes a nice, light introductory course to whet the appetite and tease the palate. It’s a mellow hop with a burst of citrus that doesn’t linger long, but the flavor lands nevertheless. 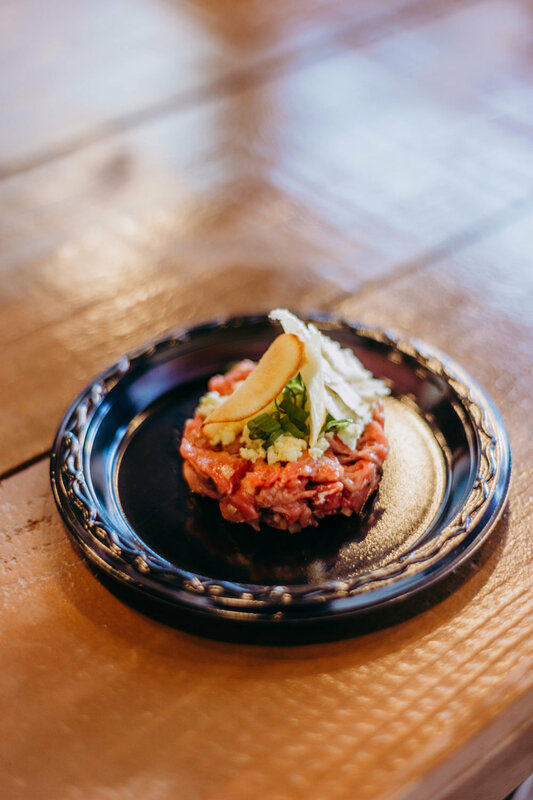 The beef tartar is bright, savory, and whimsical — the perfect opener to any dinner party or other extravagance, to be assured. 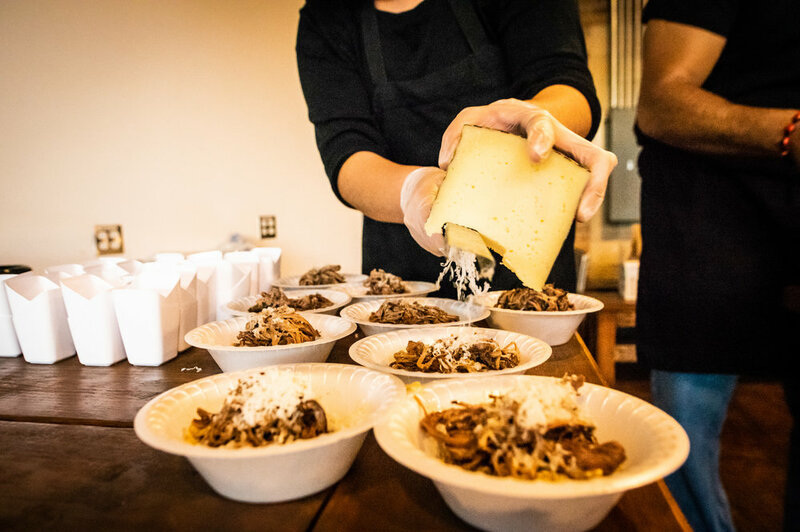 Marinated in guajillo oil, the sirloin adds an extra dimension of flavor, while the egg adds a subtle, neutral silkiness without overwhelming the main attraction; that legwork is left to the whole grain mustard woven throughout the dish, residing especially in the cheese. Ten:One’s opening number in this event — the Red Dragon — is bold, tangy, and acerbic, with a particular acidity in the mustard that cuts through the muscle of the dish. Together, the food is tempered by the beer: any possibility of overload via cream, tang, or sweetness being met with the bitter hops of the IPA, maintaining a playful equilibrium that awakens the curiosity to what lies ahead. It’s the pinnacle of the flavors found in the American summer garden party, smoky meats topped with mustard and cheese with a cold, hoppy beer to wash it all down. The yucca chips just cement the notion that this is a dish of opulence — finger food fit for a southern ball or a gallery opening, or the late night party after the evening’s affairs. When the unstoppable flavor of the mustard cheese and the immovable hops of the IPA collide, it’s a power struggle that provides quite the show for the palate. Both meet each other, dance, then drift away; ships passing in the night. Coming in like a crisp autumn wind, with the sound of leaves rustling along concrete streets while wind chimes signal the somnolent evening, the Dapper Apple is a perfect seasonal amber. It’s mulled wine, caramel apples, and spiced cakes all rolled into one. If the last course felt like summer, this would be fall. The dapper apple flavors fold perfectly into the sweet and savory layers of the salad. The churrasco steak is every bit the fresh-off-the-grill succulence that all steak aspires to, while the light citrus and earthy walnuts bring a bouquet of vegetal brightness to the very grounded, earthy dish. The creamy tang of the Fior D’Arancio cheese bites past even the most forward of the savory flavors, giving the dish some spirit, along with the citrus dressing. In unison, the apple in the beer and the blue cheese of the salad evoke a sweet custard or apple tart. The citrus mingles with the apple like an old friend while the spices of the amber ale — among them cinnamon, nutmeg, ginger, and a pinch of cayenne — only serve to cement the fall flavors and the warmth therein. “Embrace the funk,” we’re told, and with this dish we did just that. The cooked down mushrooms dance with some added Texas flair in the beef jerky bits, and the cheese itself is Ten:One’s funkiest: the Delice de Bourgone. But let’s backtrack here. The beer — a winter warmer done in the British style, relying solely on malt, no adjunct spices — is boozy with a slight roast from the chocolaety British malts. It retains a lightness, as opposed to going full bore on the typical stoutness of winter warmers, while retaining that comforting spice. It’s bruschetta meets Texas toast: a series of freewheeling buttery bites with a twice-baked potato vibe, with the funky, yet creamy cheese, the aromatic garnish, and the meaty base of the mushroom and jerky. 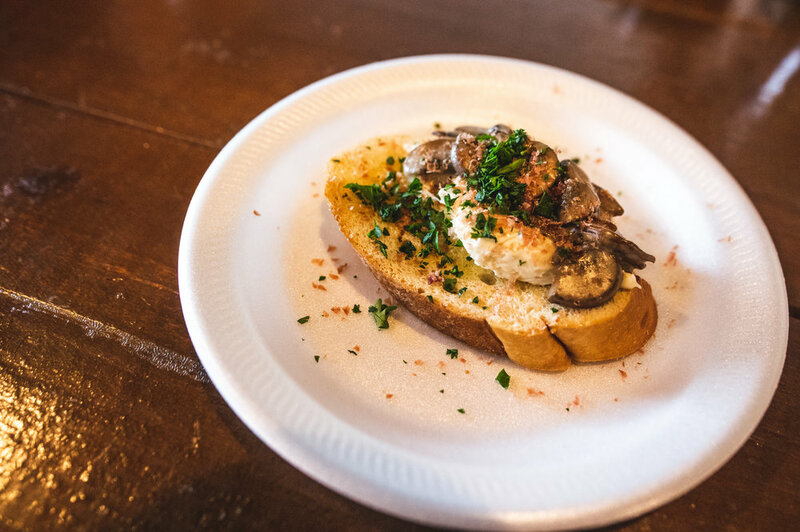 The cheese and mushrooms pair perfectly with their pungent funky and fungal flavors. The shaved jerky atop it all adds the slightest evocation of black pepper or teriyaki-esque umami to the dish. This treat from Burgundy has a melted triple cream and Brie-type flavor, spreadable but by no means subtle. The overall dish is silky and creamy but with enough resistance that it lends itself to a feeling of fullness, completion, reward. 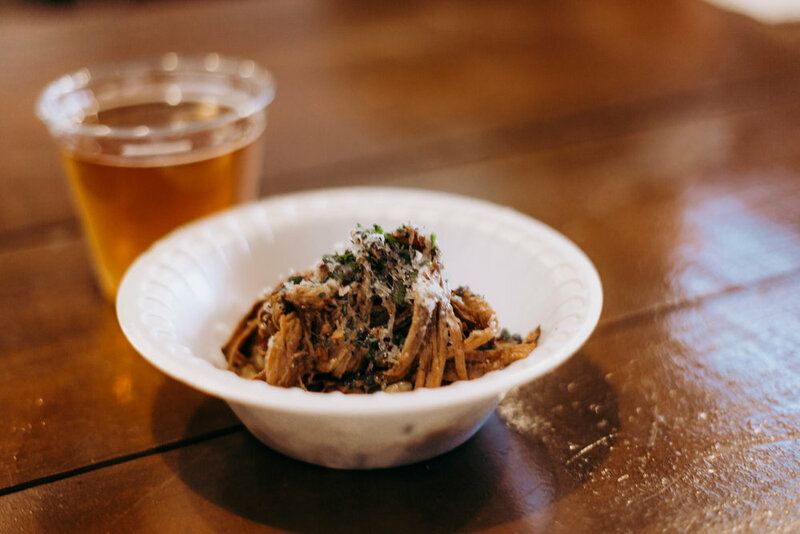 Richness in the dish feeds perfectly into the sweet, hearty extravagance of the beer. 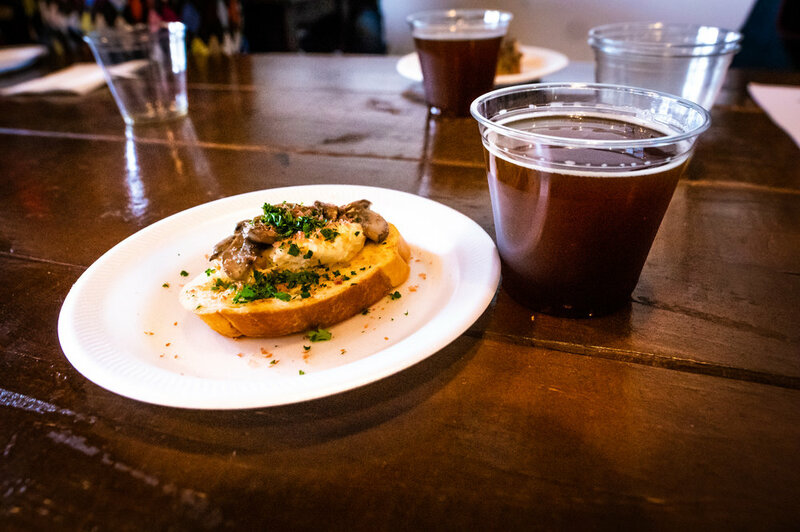 Pungent flavors of the mushroom, sauce, and cheese are all absorbed well by the bread and tempered by the toasty beer. It’s definitely a holiday’s fruitcake flavor, overall — the candy sugar notes of the Belgian malts blend their sweetness with the chocolate malts to create a chestnuts-by-the-fire flavor that the crostini coddles in its warm, earthy delights. Even the cheese carries a warmth, like a favorite dish prepared by loving family for a return home from a long, winter voyage; or, a freshly prepared snack on a cold Saturday afternoon, nestled inside watching movies, drinking cocoa, and making demands of a doting mother. 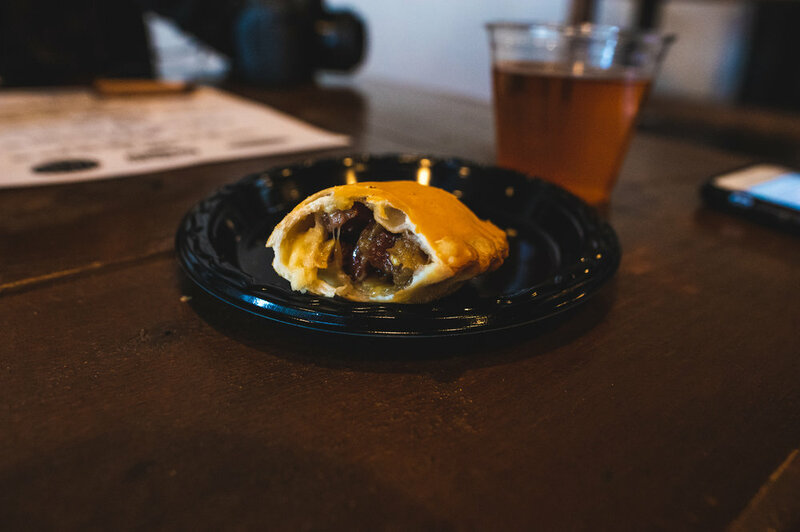 Homefield advantage is the name of this course’s game, as both offerings showcase some of the tried-and-true staples of these two gastronomic giants: Armadillo’s stalwart flagship the Greenbelt Farmhouse Ale, and Boca 31’s empanadas. The farmhouse is an emergence into spring after a long, sleepy winter: bright citrus and earthy floral notes, the renewal of the fields, the smell of grain in the air. It’s slightly sweet, blooming with fruit and vegetal flavors — a springtime pleaser providing an uplifting Belgian breeze to the pastry. In this match off, magic is made of cooked down sausage with some onions and Smoked Habanero Cheese all stuffed into dough. 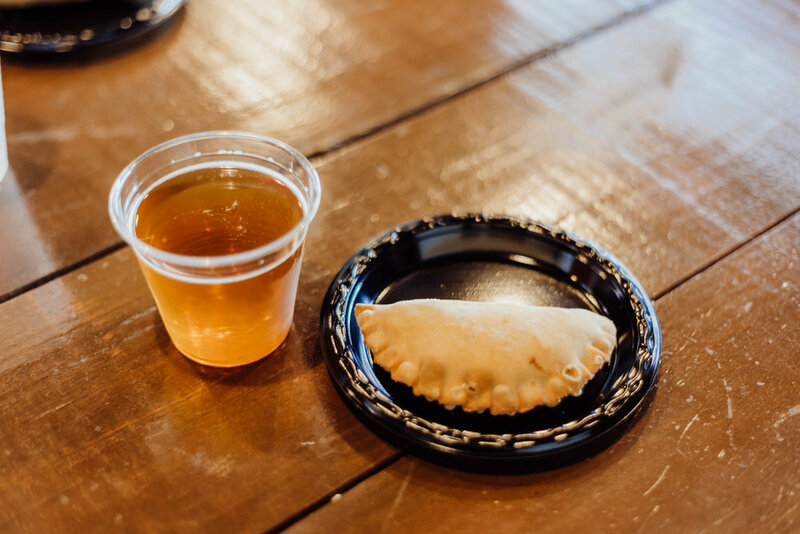 It’s truly a treat and, as we were told, there’s “no sauce because I wanted to taste the love.” This love is found in every fold and flavor of the empanadas. The crust is stalwart but flaky, a perfect biscuit-like crunch before delving into the cooked down sasusage and onion within. It’s a buttery boundary that holds its own against the juicy contents within, being neither soggy nor dry. While the sausage and onions pack a punch, the potato is filling, creamy — the perfect portable lunch. It feels like a freshly baked meat pie sitting on the windowsill to mark the first of the awaited vestiges of the approaching harvest in earnest. The seasons come full circle as spring returns inevitably to summer, where barbecue and cocktails rule the day: a course of bright and bold flavors. 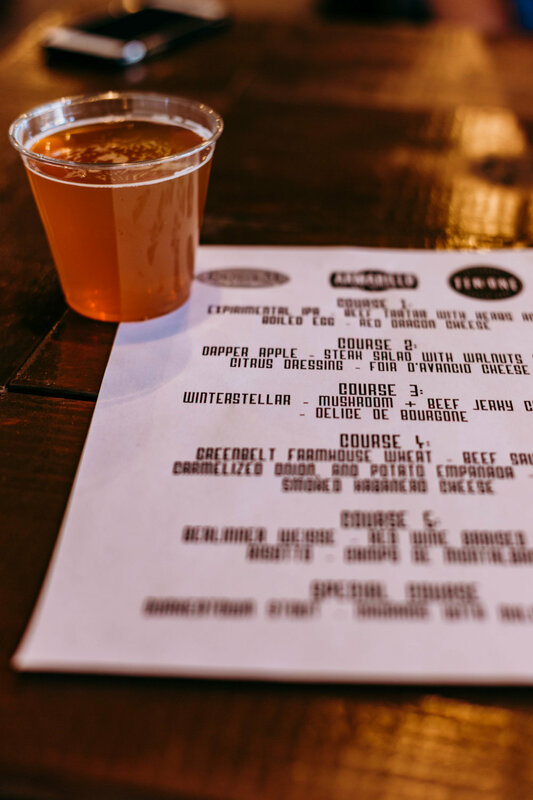 The tart Berliner Weiss — a kettle sour, Bobby Mullin’s first successful of the kind — fulfills half the bargain while the braised brisket risotto takes up the rest. Vivid and daring, the Berliner Weisse lends itself a refreshing introduction to, and escape from, the heavy meat and pasta dish, while also mingling its effervescence with the dry red wine and its funkiness with that of the Campo de Montalban cheese. Our brisket is roasty with a coffee-esque depth to the flavor. It’s the slightest bit of a dark chocolate bitter with that tangy char empowered by the manchego. It resists to the perfect degree, giving a chew that soaks up the flavors of the seven-hour red wine roast. The wine adds an astringency, the cheese accentuates the smoke; these two combined bring to life the effort of love that goes into a good brisket. Add that stock and cream and the brisket accomplishes a gamut of textures and notes for the palate to wade through. The risotto is hearty with a slight smoke to it, the funky tartness of the cheese making good friends with the Lactobacillus of the kettle sour. Brisket and risotto go together like Southern BBQ and homemade Mac ‘N Cheese. Whereas the latter might be found in any smokehouse or BBQ joint in a square mile radius, this is the stuff that your pitmaster dad dreams of. 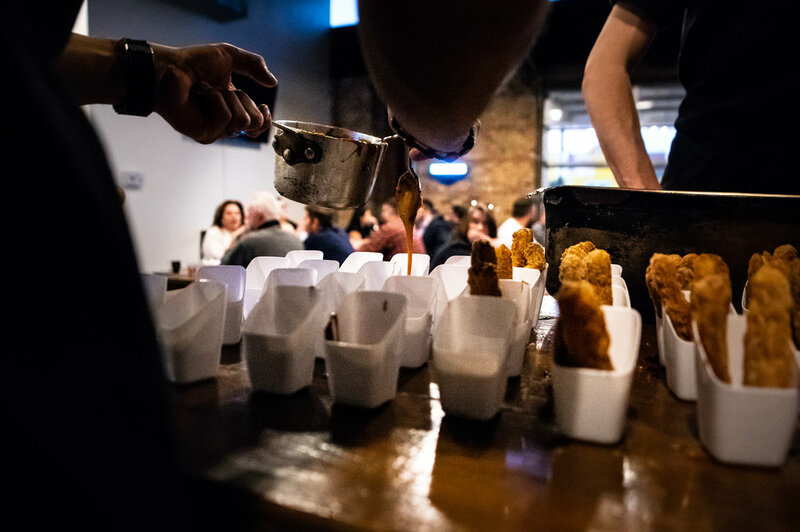 Enjoy these visions of sugarplums or, better yet, taste them for yourself; those in attendance were decidedly pleased to. We reach the epilogue, a final denouement of the overall meal which held its fair share of desserts — whether masked as blue cheese in salad, or in sweet fermented beverages. 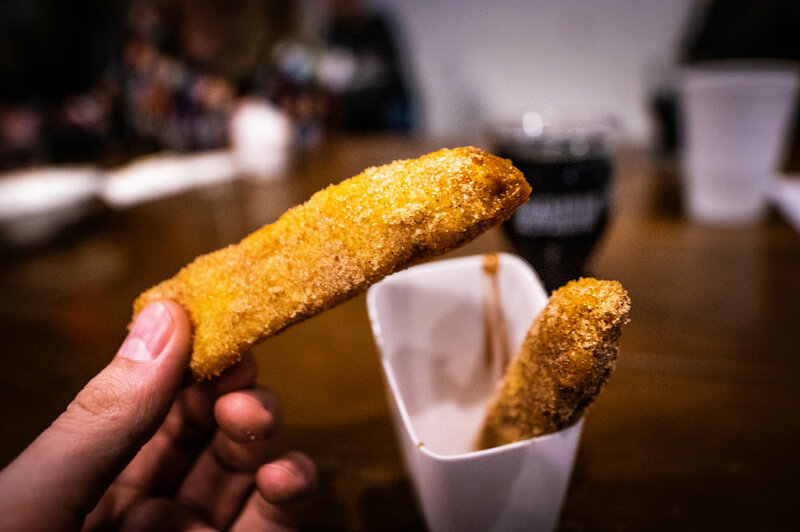 It’s a conclusive tying together of the experience with a fun, carnival-esque offering, like a treat of street food after the evening’s night on the town: churros con dulce de leche. Piling onto the dessert flavors, the Quakertown Oatmeal Stout only serves to further indulge the senses in short-but-sweet opulence. The unrefined maple syrup is sweeter and fuller than your average tabletop syrup, the addition of which gives the beer a rich saccharine note that brightens the dark chocolate and roast tones. 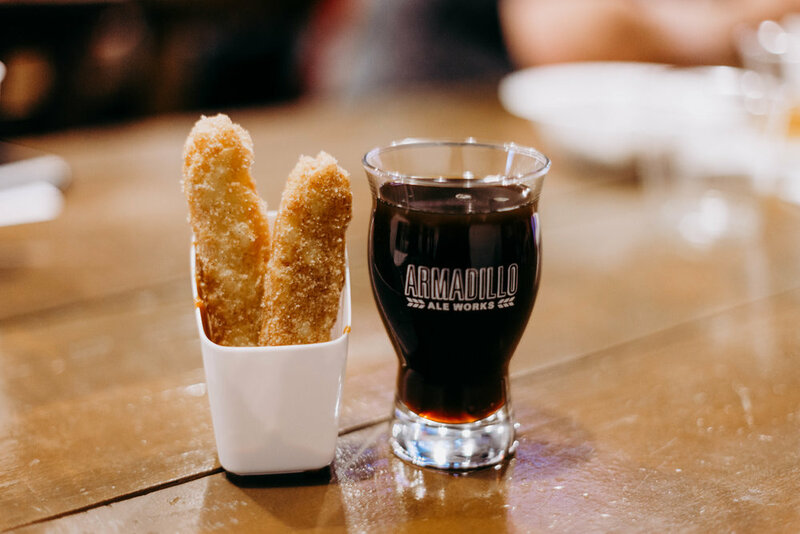 Fluffy with a spiced crunch, the light breadiness in the churros gives way to silky-sweet dulce de leche sauce, which the roasted chocolate oats of the beer synchronize well with. The Quakertown as coffee and syrup, and the churros as pancakes or doughnuts incarnate, the meal comes full circle with a light and revitalizing breakfast-like offering. A coworker’s box of a baker’s dozen brought into the work meeting, or a heartfelt bake from a neighbor as compensation for a favor, it’s a crowd-pleasing finish to a delightful evening. Suddenly, the event becomes briefly social like the door-to-driveway conversations after any good party. We mosey on home, already rifling in the fridge as our bellies burst and the fantasy of the evening fades, dream-like, into the bliss of another day victorious.